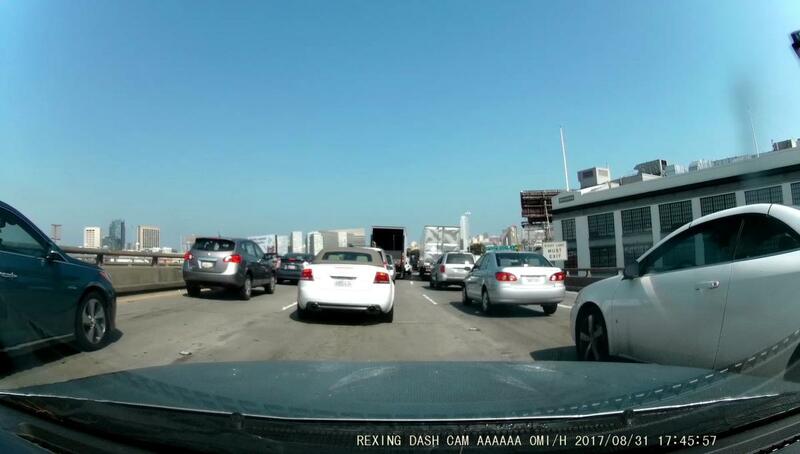 Rexing’s $100 V1 dash cam takes very good day video, decent night video, and is easy to set up and use. We like it. But it’s bare-bones: Adding GPS, which we recommend, costs an additional $30. If you have room in your budget, for $170 you could step up to Rexing’s dual-channel, dual-camera V1LG with integrated GPS, or go to our full list of up on dash cam reviews for more options. The Rexing V1 is a little on the large size. Not large enough to interfere with anything if it’s mounted in the correct location (behind the mirror is good), but if you’re looking for tiny—this isn't it. We think GPS, a $30 add-on for the base model V1, is always a good idea. Especially if the idea is to win your litigation. 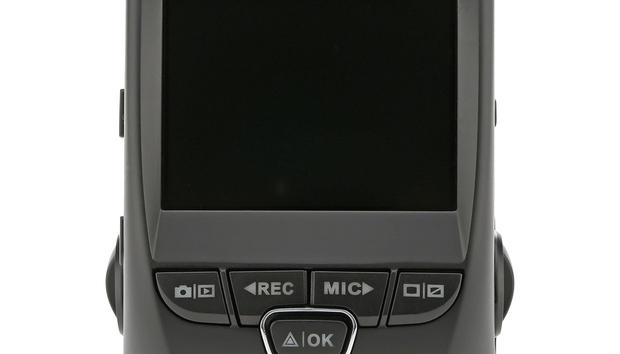 The size, however, allows for a 2.4-inch display, large buttons, and enough air to moderate heat. There’s a single micro SD slot, but Rexing doesn’t include a card with the basic $100 V1 model we reviewed. Add $20 at checkout for a 32GB card. Which brings us to a discussion of the different models. The V1 has a GPS port, and there’s a $30 add-on module, but the auxiliary camera port is deceiving because the V1 is only single-channel. The $130 V1P is dual-channel and actually comes with a rear camera, but again, add $30 for a GPS module. Probably the best bargain of the bunch is the previously mentioned V1LG, which has integrated GPS, a rear camera, and a 16GB micro SD card in the box for $170. That is a pretty good deal. We've mentioned GPS quite a bit. Why? Having GPS info on your video could be the difference between winning and losing your claim, or lawsuit. As a bonus, it’s handy for placing those interesting sites on your road trips that you may not have had time to stop and view properly. The Rexing V1 mounts flush to the windshield, and the camera element rotates vertically to match the horizon. You might consider using a level when mounting the unit, so you don’t wind up with horizontal skew in your video. The mounting did seem to affect the video somewhat—more on that later. The V1 mounts with adhesive, but the adhesive and the mount are separate. Note that cooling the double-sided adhesive tape (in the fridge if necessary) makes it much easier to remove the protective film. You’ll know if you need to do this when the first profanity pops into your head. 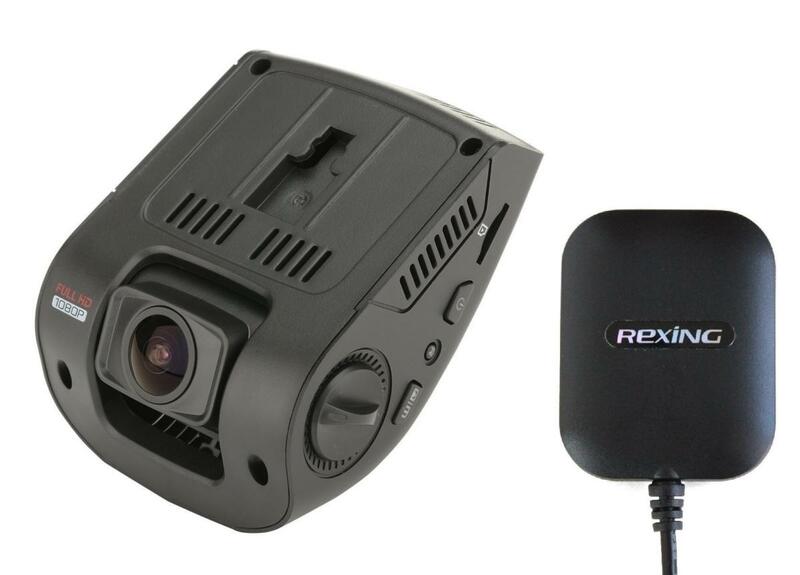 The Rexing DashCam V1 mounts flush with the windshield, though a $6 suction mount is also available. As long as you’re careful aligning the unit horizontally when you mount it, the adhesive is probably your better option. The Rexing V1 skips driver-safety features such as lane departure or collision warnings. We don't miss them. But it does have one feature that’s new to us: You can enter your license plate number for watermarking your videos. 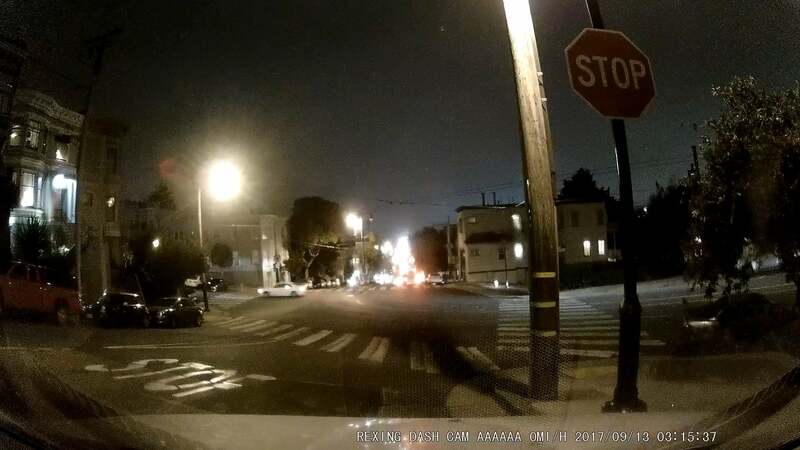 There’s probably no legal benefit, as anyone could enter the info, but if you use the camera with different vehicles, this will tell you which one you were in. The V1’s 170-degree, 1080p video quality is a mixed bag. It is sharp and extremely stable, if not quite as color-rich as what we've seen on other like-priced dash cams. But we noticed occasional, mild artifacts when ambient light conditions shifted. Either because of the distance between the windshield and the lens, or the rather wide viewing angle, the camera also captured an unusually large amount of dashboard reflection. There’s certainly nothing wrong with the V1’s day video. There is, however, some reflection from the dashboard. With the camera tilted farther upward, this effect decreased but did not disappear. The night video produced by the Sony Exmor sensor was good, especially in low-light conditions. Headlight flare was a tad more distracting than we’ve seen from some other dash cams recently, but certainly better than with the entry-level cameras of a couple of years ago. Again, either the wide-angle lens itself, or its distance from the windshield, made the V1's images more susceptible to distortion due to interior moisture or moisture on the outside, which we encounter frequently in foggy San Francisco. The V1’s night captures are good. 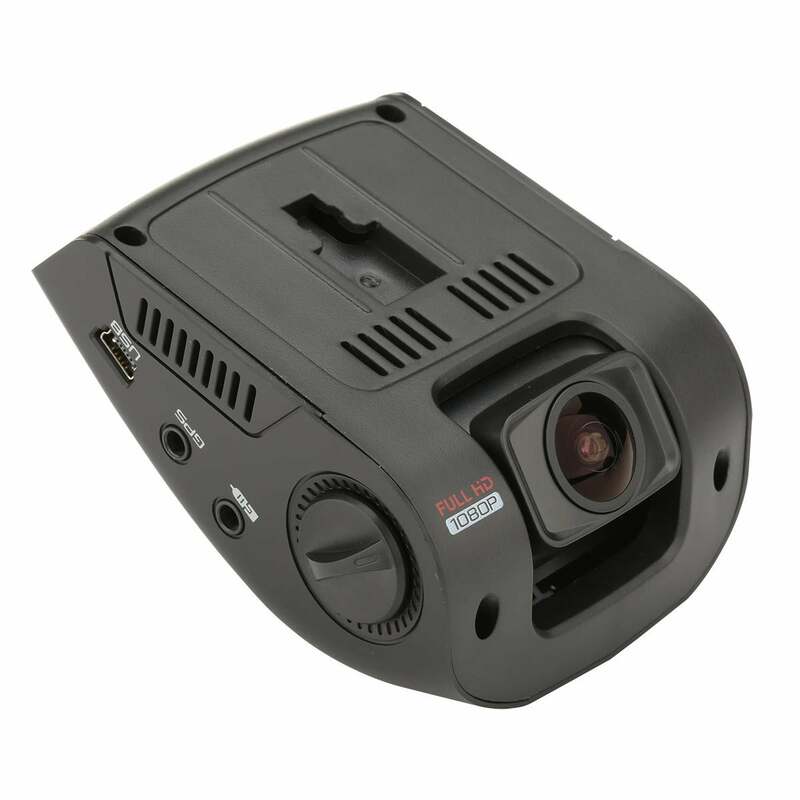 Its Exmor sensor handles low light situations well. Some of the distortion, but not all of it, is San Francisco fog. The Rexing V1 is a competent camera, but too sparsely featured to garner anything better than average marks in our review. The company made sure I understood that it provides something that can be in short supply with some dash cameras: technical support. If my interactions with the Connecticut company are any indication, it should be quite good. While this is a solid product that takes good video for not a lot of cash, the company’s V1LG is the much better deal overall.